Card Text Silvertooth enters play ready. 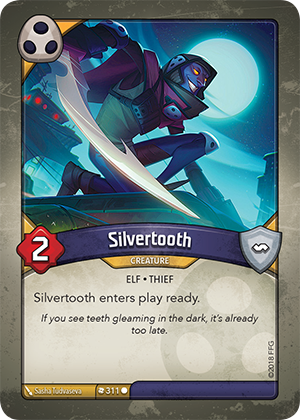 Flavor text If you see teeth gleaming in the dark, it’s already too late. I’m the first player and it’s the first turn of the game. I choose to play Silvertooth as my only card. Can I use it the same turn? Yes. The first turn rule only restricts you from playing or discarding more than one card from hand. Using a card is not restricted. Therefore, you could use Silvertooth (e.g. to reap).